US Climate Action Network’s mission is to build trust and alignments among members to fight climate change in a just and equitable way. Keya Chatterjee is Executive Director of USCAN, and author of the book The Zero Footprint Baby: How to Save the Planet While Raising a Healthy Baby. Her work focuses on building an inclusive movement in support of climate action. Keya’s commentary on climate change policy and sustainability issues has been quoted in dozens of media outlets including USA Today, the New York Times, Fox News, the Associated Press, The Washington Post, and NBC Nightly News. Prior to joining USCAN, Keya served as Senior Director for Renewable Energy and Footprint Outreach at the World Wildlife Fund (WWF), where she worked for eight years. Before that, Keya was a Climate Change Specialist at USAID. 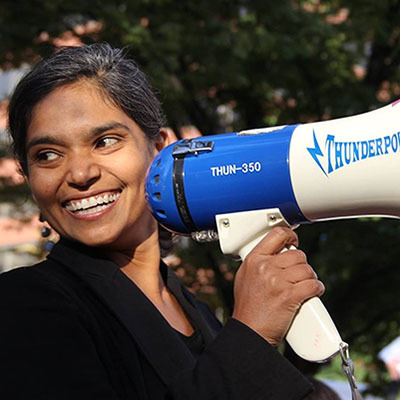 Keya also worked at NASA headquarters for four years, communicating research results on climate change. Keya was a Peace Corps Volunteer in Morocco from 1998 to 2000. She currently serves on the board of the Washington Area Bicycling Association. Keya received her Master’s degree in Environmental Science, and her Bachelor’s in Environmental Science and Spanish from the University of Virginia. Photo © Erica Flock.